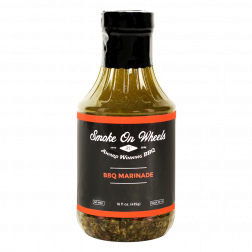 Add extra flavor to your hunks of meat with a half gallon of Smoke on Wheels Marinade & Injection. - Marinating/Injecting with Blue Ribbon winning marinade will help you become a BBQ Pro! A barbecue marinade for BBQ Masters. Smoke On Wheels will make all your food blue ribbon worthy. 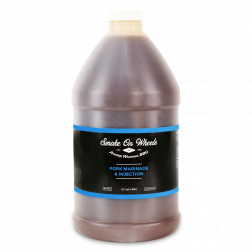 - This BBQ marinade leaves your meats juicy, tender and full of flavor, making your guest feel like they're at a 5-star restaurant! 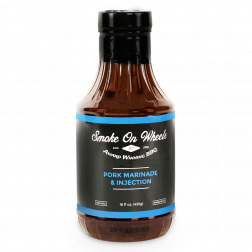 Soak your pork to BBQ perfection with the Smoke on Wheels Pork Marinade & Injection. - Works as a general grilling marinade but is great with slow smoked BBQ. Add a boost of flavor and tenderness to your BBQ.